To buy this Chloé-inspired handbag dupe for $39.90-$49.90, click here. 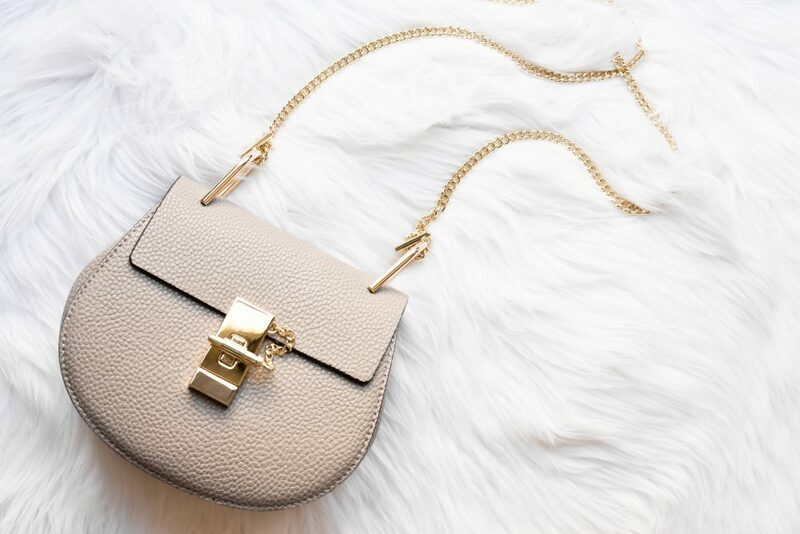 One of the most popular designer crossbody bags is Chloé’s Drew. 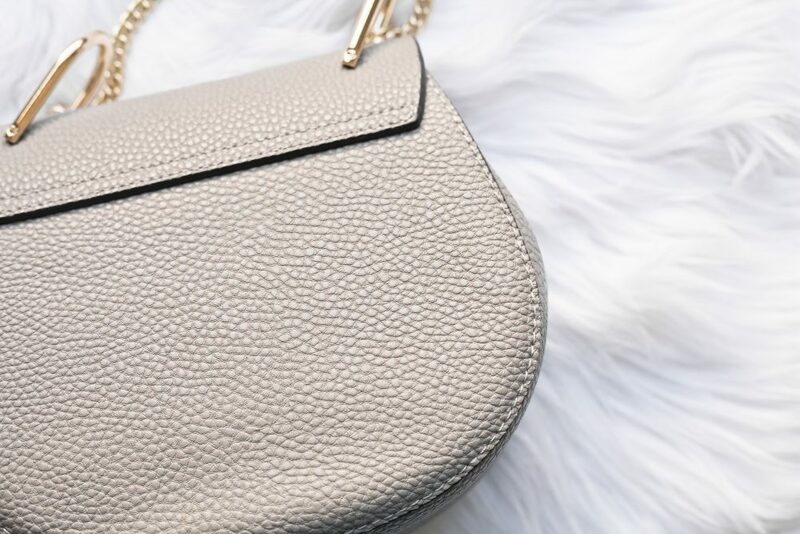 A subtle yet timeless purse, the Drew is a staple in many fashionista’s wardrobes as it pairs perfectly with both bold outfits and minimalist ones too. However, for such a simple purse, I can’t bring myself to pay $1,650. I honestly wouldn’t want to pay even $100 for such a small bag. Luckily, Lacattura has done it again with another amazing designer dupe. This genuine leather purse is available for only $39.90-$49.90 on AliExpress, depending on the size. 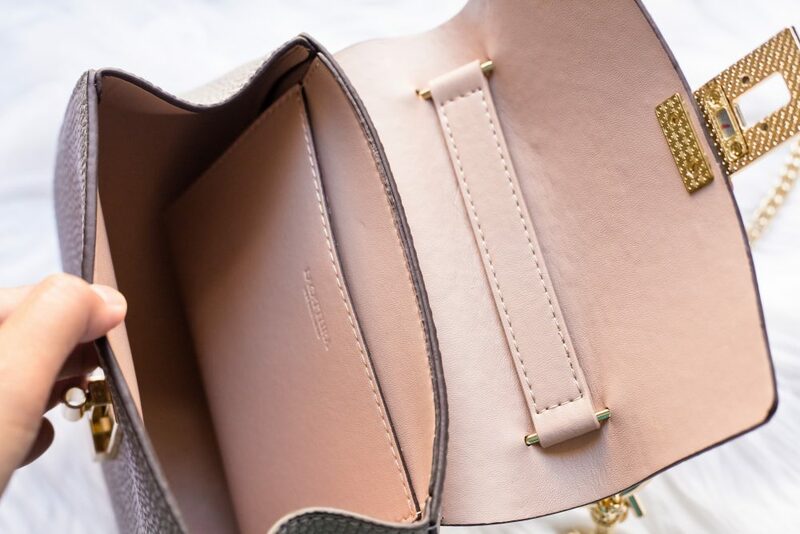 After having recently gotten another purse from Lacattura, I was very impressed with its quality and decided to take another chance with the same brand. Of course, they didn’t fail to deliver! This is another beautiful quality designer dupe. 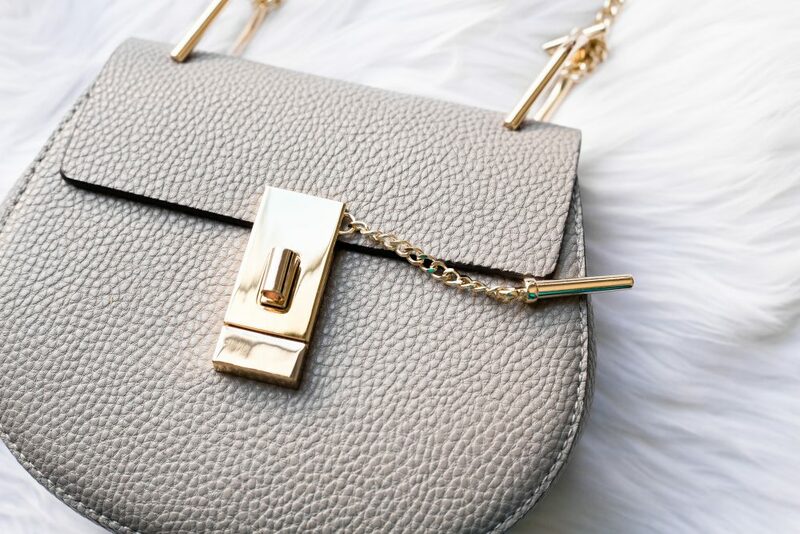 Hardware: Unlike most lower-priced purses, the hardware on this purse is weighted and substantial. I like the weight of the chain, since I’ve always had issues with chains slipping off my shoulder, but this one stays put. The front lock also turns very smoothly, which was a huge concern for me since I’ve also had some bad experiences with locks breaking on bags. Leather and Stitching: I wasn’t hesitant about the quality of the leather nor stitching since the first Lacattura purse I bought was superior in both categories. This one is also the same. I didn’t find any loose threads or stitches, and the leather is a nice and soft yet stiff leather that does not sag. I never paid close attention to the way the chain was attached to the original Chloé, but after pulling up a few pictures on Google I did notice that the chain is simply tied in a knot around the metal loops of the bag. So I was a little confused when I first opened the purse and saw that the chain was separate. If the real Drew is also the same, then I don’t believe there is any con to this. I haven’t had any experience with the chains undoing themselves due to the metal bar that prevents the chain from slipping out of the knot. The purse also ships from China, so like most items from Aliexpress, expect to wait a long time. I ordered this back in early December and think it may have been stuck in US customs because I didn’t receive it until the end of the first week of February. Although not genuine leather, I did spot a few Drew dupes on Amazon that come with free Prime shipping. While I can’t personally account for the quality of these bags, if you’re okay with synthetic materials and the available colors, this is a great option if you want to beat waiting for a few weeks to a month for the item. Overall, it was very much worth the wait! Getting a beautiful quality, genuine leather purse for just around $40 was a perfect price. Most dupes of Chloé’s Drew are made of synthetic materials and hover around $50 at most fast-fashion retailers. Usually, genuine leather purses are around $60- $100 starting on the low-end, and that’s a price point I don’t mind paying for quality. But $40 really takes the cake on this one – it was probably my best bargain buy! Lacattura’s bag is available in a large variety of colors for $39.90- $49.90 on AliExpress, depending on the size. Liked this post? Subscribe to the newsletter below for more designer-inspired dupes delivered to your email! Girl, you always aim to please!! Thanks for this, what was the shipping cost? Being it came from china? Hey JJ! Shipping was actually free! It was shipped with First Class International, which is the most inexpensive international shipping. The only downside was that it took a little longer than most international parcels. And the tracking doesn’t provide up-to-date tracking, only when it’s been dispatched and delivered. I’m glad you are a kindred spirit with DWR. Having said that, I wouldn’t have found you. My question is this, I ordered a few purses from AliExpress. I don’t know if they all came from the “Chloe” site. I don’t know if you’ve ordered from any of the others and if so, did you have the same luck with the Quality? My husband and I go to China a few times a year. We hit the Knock Off Markets as well as having clothing items custom made. It’s amazing how they can take your favorite garment, that’s become tired, and bring It back to life. Anyway, if you get a chance to respond to my question, I’d appreciate it. Thanks for looking for similar designer items, for less. We all love to look great, at a fraction of the cost. If you’re asking if they are all made from the same wholesale manufacturer and re-branded, it seems to me that such is the case with most of the merchandise on AliExpress (and even eBay and Amazon, in some cases!). But I’m not 100% sure. The one that I got was one of the lowest-priced items of this particular purse design on AliExpress and the quality is amazing, so I would say that it’d probably be the same exact product. You may just be paying more for better shipping or packaging if you buy from another seller, if that’s the case. That’s just my theory, though. Hi! 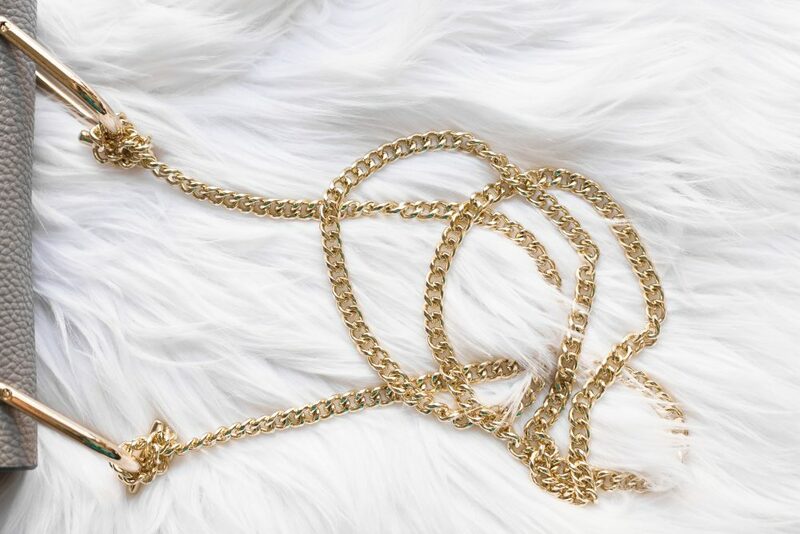 Hope I am not too late to ask u this question: is this chain on the lock the exact dupe to the authentic Chloe? Thanks a ton! Hi Luna! I’m not sure if I understand your question – the actual Chloe bag has “Chloe” stamped on the lock. This is a dupe, meaning it’s not passed off as a real Chloe – it is simply designer-inspired and has no logos claiming to be the real deal. If it had any logos or branding claiming to be the designer brand, it would be a knockoff (and also illegal for me to encourage others to purchase). I LOVE my new “Chloe” Drew bag; only thing is I thought I ordered the large size. Am confused. Please explain. Also is there anyway to get it faster shipping? Overall glad I took the a chance on someone I “met” on instagram. Hi there! The one I have is the small one, the large one is significantly bigger! I believe you can also pay for expedited shipping, but I’m not sure if the seller has changed their policy. If you think you ordered the large one and got a smaller one, you should definitely message the seller and let them know! Hi there! Just discovered your blog, that and this bag were amazing finds. I was wondering if you knew what the size difference between the small and the large versions was – cause one of the comments above says the large is significantly bigger but it doesn’t seem to be that much bigger from the description in the link? Would appreciate any insight you have about how accurate those size descriptions tend to be from that site. Thanks so much for posting this! Hi! I just came across your site and love this bag. I’ve been looking for a dupe because I can’t spend the money on a real Chloe. What color did you purchase? It looks like grey? I love how it shows up in your pictures, but the AliExpress photos look a little different, so I wanted to double check. Thanks! Hey there! I actually bought the small grey one! Sorry for another question – the link in your post goes to a bag from Simowear, and if I search Lacattura, I find a different bag at a slightly different cost. I trust your post and want to make the purchase, but wanted to make sure I get a bag that someone else knows the quality of, if that makes sense? If I follow your link is that where you purchased? (I click and see this link: https://www.aliexpress.com/item/2016-Hot-Sale-Popular-Fashion-Brand-Design-Women-Genuine-Leather-Cloe-Bag-High-Quality-Real-Cowskin/32771192728.html?aff_platform=link-c-tool&cpt=1509827568438&sk=2vFMvbE&aff_trace_key=21c2471ec0b24d648fef8b17b974c602-1509827568438-08707-2vFMvbE&terminal_id=3419b7a3db2e427cb7ecb2e9afe315cc) But if I search Lacattura, I find this link – https://www.aliexpress.com/item/CATTURA-women-messenger-bags-2015-genuine-leather-handbag-ladies-Chain-shoulder-bag-clutch-fashion-brand-candy/32501812948.html?spm=a2g0s.13010208.99999999.263.z5p2G2. Thanks for answering my questions and sorry for all of them!! Hey, no worries! All of the sellers on Aliexpress are pretty much selling wholesale items and Lacaturra is one of few of the manufacturers that produce this handbag style. Simowear (the link I posted on my blog) is the name of the seller/Aliexpress store that sells this handbag, but if other sellers on Aliexpress purchase from the same manufacturer (Lacaturra), they will have the Lacaturra logo inside the handbag (as seen on the inner pocket in my photo). The link you find is from VIVINI Store which also probably bought their handbags wholesale from Lacaturra (the Lacaturra logo is on their images). Essentially, it’s the same handbag. So it doesn’t matter really, just a matter of if you prefer a cheaper price or a seller with a better track record with their customers 🙂 Hope that clarifies it for you! Thanks, that cleared it up for me! I appreciate it. Do you use PayPal for making purchases ? Great article! I don’t believe Paypal is an option for AliExpress, but I’ve never had any issues with fraud! AliExpress also offers buyer protection, so if you don’t receive your item within a certain amount of time they will give you a refund. They will also give you a full or partial refund if the item is not as described! Gorgeous! I have not gotten any Miu Miu dupes but this one’s a beauty! Just came across your blog and I am already loving it! I’ve been eyeing the drew bag for quite some time now, but unfortunately I don’t have the privilege to fork out $1.6k for a bag. I just ordered from your link, and I can’t wait for it to come in! I am just worried though, because I’ve had not had the best of luck ordering from AliExpress… I feel like it’s always a gamble, but if I get something as good as yours, I’ll be happy. Keep up the good work on your blog! Hey there! Thanks for the compliments! I agree, Aliexpress can be a major hit or miss, so I always try to buy items that have a lot of customer reviews with images on the item listings. That helps prevent headaches! I love this! Thank you so much for reviewing an Ali Express brand – it gives me so much more confidence ordering it 🙂 Would you consider doing an entire post on Ali Express brands or sellers that you recommend?